Over the last few weeks the world has watched horrified as the continuing plight of refugees fleeing war-torn Syria has been broadcast across our screens; and only yesterday David Cameron finally announced that the UK would resettle 20,000 displaced Syrians as part of an on-going attempt to alleviate the crisis. Anyone with any notion of history will not have failed to notice how much of what we are seeing across Europe echoes scenes of 1945: trails of exhausted refugees slowly making their way along the roadsides; families that are starving, dirty and cold, all hoping to make a new life somewhere; children sat on a father’s shoulder or clutching a mother’s hand. Many are lost, confused and bewildered, and whilst most have a sense of where they are heading they have little idea of how exactly they will get there. So they walk. They bed down in railway stations, fields and alongside roads. They find themselves being cajoled into reception centres where military personnel, aid workers and volunteers do what they can to control the situation but, as the numbers reach the hundreds of thousands, the authorities are losing control. The media is rife with comparisons to the end of the Second World War. But are these comparisons justifiable and, if they are, can any lessons be learnt from the past as, once again, the international community faces another humanitarian crisis? The similarities are certainly evident. The imagery and rhetoric used by many reflects the emergency that occurred when, as the Nazi regime fell, the concentration and labour camps were liberated, and many thousands of displaced people that had been usurped from their countries took to the roads. Today’s situation, of course, is very different. In 1945 most of those travelling across Europe were trying to make their way home whilst today these people are fleeing war, persecution and poverty in their own homelands and are, instead, trying to make a home for themselves somewhere else. However, in both situations these journeys have not been made out of choice, and this is something that in 2015 we need to be sympathetic to. The causes of these terrible events bear similarities too and are – certainly in the case of those fleeing Syria – the consequence of war. During World War Two the racial, ideological and economic ambitions of the Nazi regime had uprooted many millions of Europeans, driving them from their homelands, imprisoning them, or forcing them into labour camps. When afterwards they were finally released again, roads and railway stations bottlenecked as the displaced tried to return to their homes. It is a gross over-simplification but once these people had been returned to their homelands the post-war refugee crisis was largely considered to be over. Today’s situation however has no clear end-point. The refugees coming into Europe are being driven out of their homelands by war, oppression and poverty. 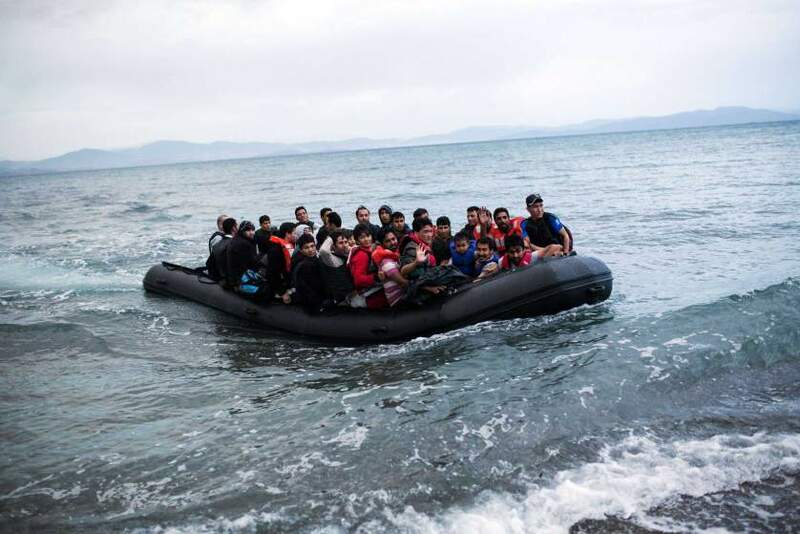 The bulk are coming from Syria but they are also fleeing civil war in Libya, repression in Afghanistan, on-going abuses in Eritrea, as well as poverty in other European countries such as Kosovo and Serbia. While the bulk of the problem might be alleviated by an end to the war in Syria and a long-needed return to stability in the region (something which we already know is extremely difficult for outside intervention to achieve), with so many other political and economic problems compounding the situation across Africa, the Middle East and Europe, it would be foolish to even hope that a clear-cut solution can be found any time soon. What is important, however, is how we as an international community and individuals respond to this fragmented but growing crisis. From almost the moment the first bullets were fired in 1939 talk turned to post-war relief, Churchill claiming as early as August 1940 that a passage of food and freedom should be established into Europe to aid those affected by the war. Certainly by the end of 1941 – by which time the US had also joined the fray – plans for relief had not only picked up pace but had also turned to the management of a united effort. Then, as with now, it was recognised that only large-scale intergovernmental action could meet the challenges; and then, as with now, governments struggled to agree, with the usual quibbles over how much money and resources it would require, and who would pay for it and how. President Roosevelt took the lead, nominating a group of four international bureaucrats to negotiate the details. 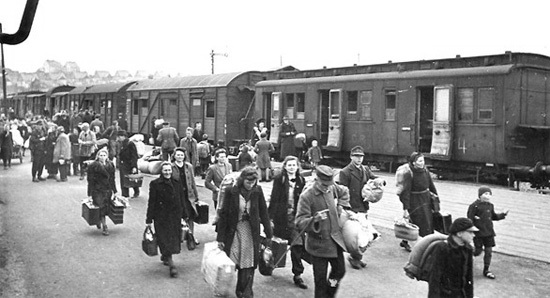 However, it took eight months for the US Secretary of State and ambassadors from Britain, the USSR and China, and then US Congress, to formulate an agreement on what would soon be known as UNRRA (the United Nations Relief and Rehabilitation Agency), an international agency to provide post-war relief, food and repatriation to the many millions displaced across Europe. The term ‘displaced persons’ (DPs) had been coined earlier in the war to identity those that have been forced to leave their home country due to war or oppression (and is a term more suitable for today’s discussions than ‘migrants’, for which today’s media has been much criticised). However it was the campaign in France the following year that brought the issue to the forefront, with some 60,000 Russians, Poles, Czechs and Yugoslavs needing to be fed, housed, and provided with medical care, and moved out of the combat area. As the Allied armies began to plan for the final defeat of Nazi Germany they realized that they would be faced with a staggeringly large problem of having to repatriate not 60,000 but in fact millions of Europeans (11.5 million to be more exact). Plans were drawn up as to how this would be done, with UNRRA required to provide teams to look after the DPs in Europe. However the agency, it was soon discovered, was rather ill prepared. Of the 200 UNRRA teams requested by the military to help control, aid and assist with the refugees flooding across Germany only eight had been produced by early 1945. All the hopes of a glorious international collaboration seemed to be disintegrating and UNRRA soon acquired the nickname ‘UNRRA the Unready’ along with widespread criticism that it was ill organised, lacked experienced and competent staff, and was severely short of equipment. That said, its inception marked the dawn of a new age in international cooperation and it was the first international body that tried to do something constructive and concrete about refugees. Its initial failures – and, thankfully, eventual success – have been well documented and any coherent international effort to deal with today’s situation would be wise to learn from UNRRA’s initial stumbling. So far our attempts to deal with today’s crisis has seen the same international muddle. This is hardly surprising. Our European community is even more diverse than it was seventy years ago, and this makes finding a solution that every nation is happy with almost impossible to achieve. The current debate about whether each European country should be forced to take a quota of refugees (and if so, how many) is a case in point. Most of those travelling through Hungary have no intention of staying there and the Hungarian government is fully aware of that. While the buses put on to ferry 4,000 of them to the Austrian border on Friday might have been an attempt to remove them from the danger of walking along motorways, it was also an effort to clear some of the problem off Hungarian soil altogether and, quite literally, pack them on their way. Today’s situation, unlike 1945, is just as much about opportunity as it is about reaching safety; if it wasn’t, these asylum seekers would be happy to stay in the first country they reach: Greece, Italy, or Hungary for example. When, as it is, many want to travel on to Germany, Sweden or the UK, countries where the economies are stronger, there are more jobs and better opportunities, not only for them but their children too. And who can blame them? Faced with the unimaginable upheaval, cost and danger of leaving your own country you might as well head for somewhere that offers you the most hope for a happier and safer future. As with 1945, Germany in many ways lies at the heart of the situation. Back then the actions of the Nazis had brought about the refugee crisis in the first place, with Germany becoming the epicentre of transcontinental movement. 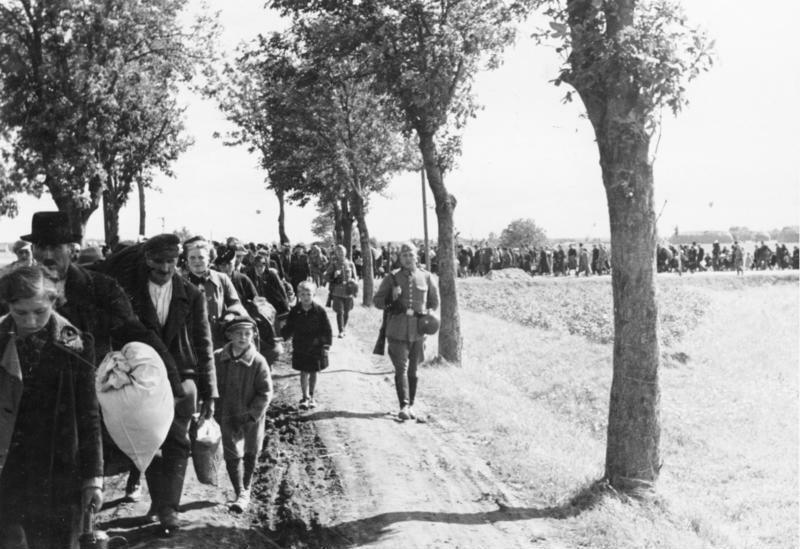 It has widely been suggested that a sense of atonement by the German people for the deeds of the Third Reich is the reason that they are now generously taking in so many refugees. This, however, is unfair. For large periods prior to Nazism, the German people have offered refuge for the oppressed, from all across Europe and beyond, including the early Bolsheviks. As Angela Merkel has suggested, the German people are merely fulfilling their ‘moral and legal obligation’ – no matter what their past. The Hungarian government however has claimed that it is Germany’s generosity that has exacerbated the problem, and that, as a result, Germany should sort it out. Along with Bulgaria, Hungary has even gone as far as putting up fencing around its borders which only goes to illustrate the insular “not in our backyard” attitude that some EU countries are displaying. What is more shameful though is that the Syrian war has in fact been raging for four years and yet only, as Syria’s terrorised people finally spill out across Europe and we find them now on our doorsteps, banging on our doors, are we prepared to pull our heads out of the sand and do something about it. Ultimately though, it is not the crowds of refugees trying to stampede the fencing at Calais, or the dead bodies of 71 Syrian migrants discovered in a lorry in Austria, or even the endless news footage of those attempting to cross the Mediterranean that has forced a continent to wake up and a public outcry to gather such momentum that governments (our own included) have no choice but to act. It is a single image. Like the news footage taken seventy years ago in Belsen – footage that shocked a world – this now infamous image of a Turkish police officer carrying the drowned body of 3-year old Aylan Kurdi out of the water has finally reawakened our collective morals. Over 300,000 have crossed into Europe so far this year. 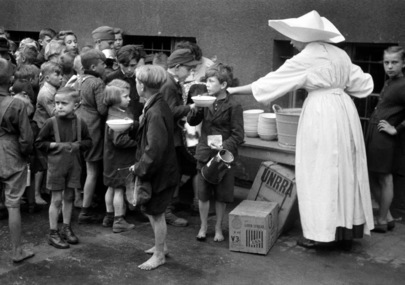 When the call to action came during World War Two for volunteers to join relief organisation such as UNRRA, to provide food, clothing and shelter, it was the everyday people that signed up and rallied around to help. And so it is today. 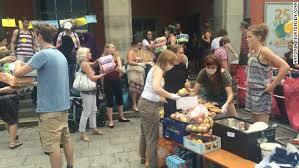 We have seen the efforts of German and Austrian villagers uniting to provide hot meals, warm clothes and bedding (even beds) for those refugees that are now arriving in their countries hungry, tired and scared, but also thankful and relieved. Across Britain many are doing the same. And so we should. We may consider ourselves British (or even European) but most importantly we are human, and as a prosperous and generous nation we have the capacity to do so much more. Our economy is strong enough to take in many more than the 20,000 over five years that David Cameron stated yesterday (the same amount I might add that arrived in Germany this weekend alone). Claims that we have a housing crisis and can’t cope are only relative. Most of us, after all, are not sleeping in tents, or in railway stations or along the sides of roads. We are not putting our safety and children’s’ safety at risk by pushing out across the Mediterranean in overcrowded and flimsy boats because we are so in fear of our lives. If we were, would we not look for compassion? Is that not the very least that we would hope for from a fellow human being? 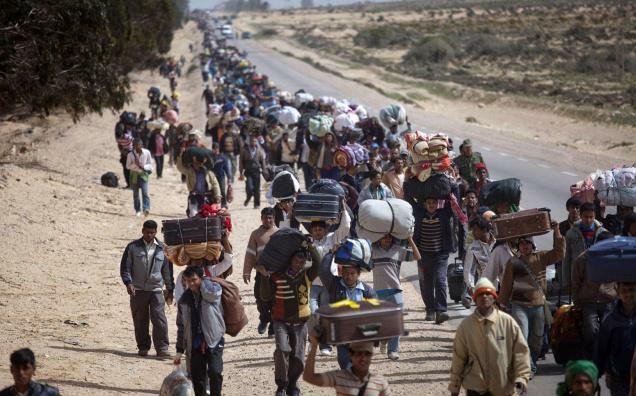 For these are not collective “refugees” or the mere components of an international problem. There are 4 million Syrians that have been forced to flee their homeland: doctors, accountants, lecturers, shop owners, students, mothers and fathers, like you and me. The refugee crisis of 1945 squeezed international relations almost to breaking point. However it also forced nations to put aside their political and economic quibbles, and tested the generosity and compassion of humankind to the extreme. During that crisis the warmth of a collective human spirit shone brighter than ever. Now, in 2015, we need to pull together once more. We need to find the generosity and compassion within us, and do everything that we can to help – not out of a sense of duty or self-righteousness or one-upmanship over our neighbours, but merely because we can and because, as individuals, each one of us has a heart. On Thursday 3 September author Patrick Ness posted a twitter post saying that he felt that he needed to do something to aid the crisis and that he didn’t know whether it would work but he’d match donations to Save the Children up to £10K. This target was smashed within two hours. 5 days later (8 Sept) the total raised is now well over half a million. As I write 429,000 British citizens have already signed a petition asking the British government to accept more asylum seekers and increase support for refugee migrants. Despite yesterday’s announcement the British government can and need to do more. By signing the petition you will help continue to put pressure on the government to act. If you’re interested in reading a little more about UNRRA I wrote a short article about it for Historia, the online magazine for the Historical Writers’ Association.